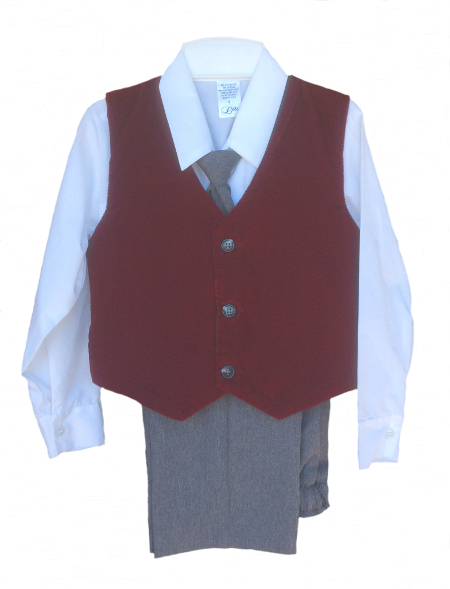 Make a statement this holiday season with this rich burgundy velvet vest and charcoal grey pants set. This outfit is a perfect complement to an evening adventure. This 4-piece set includes the burgundy velvet vest, white cotton-poly blend long sleeve dress shirt, charcoal grey Windsor clip-on tie, and grey polyester dress pants. The vest is velvet front and back and is fully lined. The pants have a zipper, pockets and an elastic back. They also have tucks in the front. The shirt and pants are machine washable. The vest is dry clean only. Lito outfits are slim cut and tend to run small so if your little guy is at the top of the size range we recommend that you order up a size.